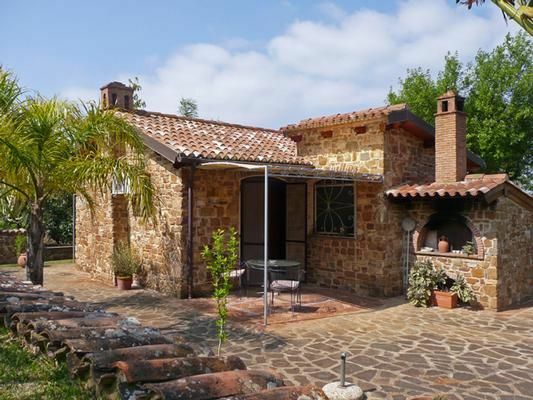 Piccolo Paradiso is a delightful cottage for 2-3 persons. The interior furnishings are tasteful and comfortable, carefully planted terraces around the house invite to stay outside. A small cove with view to the Licosa island can be reached in a few minutes walk; a private street leads to the village center. On about 50 square meters the house has one bed room with double bed, a living room with open kitchen and dining table, sofa and fire place, bathroom (shower/WC/washing machine), completely furnished terraces (partly roofed), central heating and CD-player. Additional bed on request. - Pet: once per object Costs amounting to 30 EUR (optional). - Visitor's tax: once per person Costs amounting to 6 EUR (Mandatory). Pet (once per object, Costs amounting to 30 EUR).